The Spear was said to have been thrown by the Spear-Bearing Sky-Raiser (as-simak ar-ramih), one of the Two Sky-Raisers (as-simakan). The alternate name for this star, the Banner of the Sky-Raiser, was also common and recalled the military standard used in battle. In ancient Arabic, the term simak indicated something that was used to raise something else high up. When the Two Sky-Raisers reached the midpoint of their travels across the night sky, the uppermost one was almost at the zenith, right over your head, and the lower Sky-Raiser was almost directly below it, about halfway up the sky. The Two Sky-Raisers were the pillars that held up the canopy of the heavens. 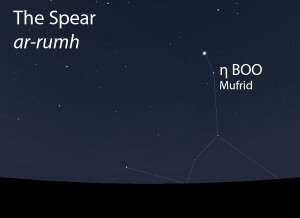 The Spear (ar-rumh) as it appears in the west about 45 minutes before sunrise in late April. Sky simulations made with Stellarium. A moderately-bright star located near the northern one of the pair of very bright stars that are called the Two Sky-Raisers. The Spear does not figure in the calendar of the rains stars. The Spear is not one of the lunar stations. 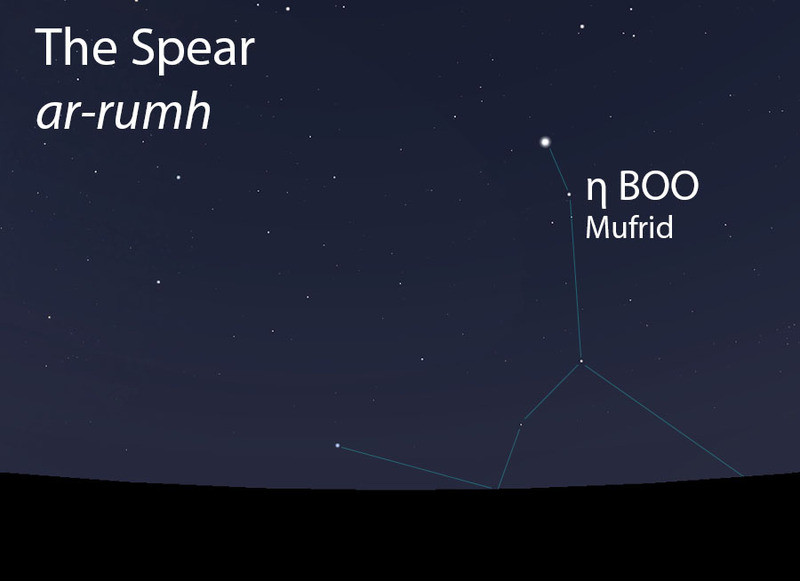 The Spear is part of the Sky-Raisers (as-simakan, السماكان) folkloric celestial complex.